I’ve been intruiged by rocket stoves lately. If you’re heading out camping this winter, you might be too. A rocket stove has a capped and insulated chimney-within-in-a-chimney. The exhaust gases swirl and rise within the inner chimney, hit the cap, and fall through the outer chimney on their way to the exhaust outlet. This swirling rise and fall creates a high-temperature combustion zone in which almost all of the exhaust gases are burned and transformed into heat. As a result you can burn small diameter wood and still get plenty of heat for cooking or heating. The photo above shows a Bobcat Rocket Stove. The teapot sits on top of the chimney-within-a-chimney, the surface of which can reach 760˚F! The burn box (where the sauce pan sits) will reach 425˚F. This is a heavy-duty stove. 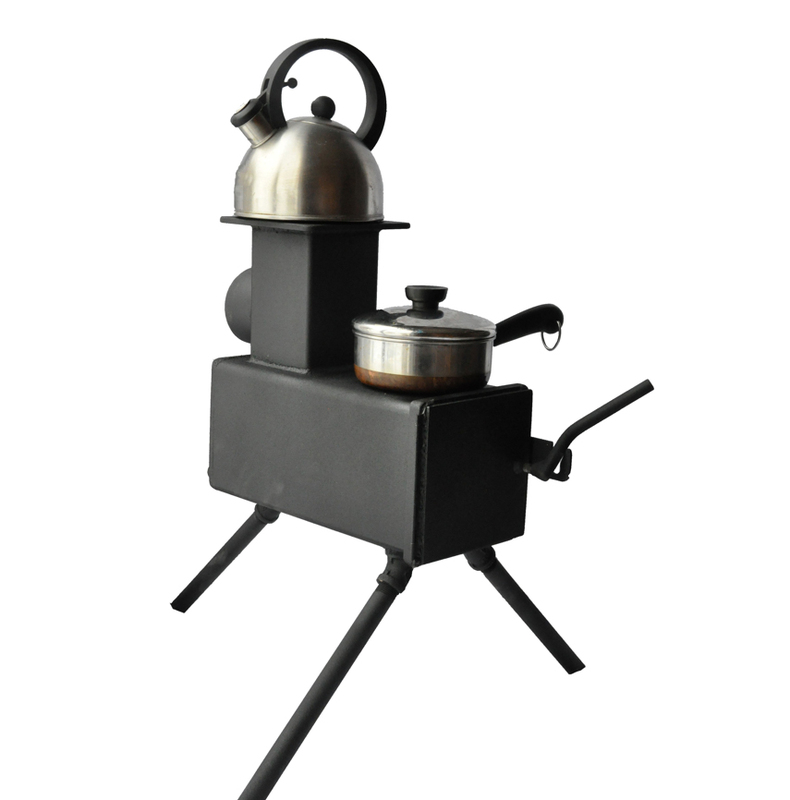 The walls are 1/4″ steel and the rear exhaust connects to a standard 3″ stove pipe. If you have a tent with a stove pipe outlet or even a small cabin, this might be a good fit. The legs are removable and the stove weighs 27 lbs. It retails for $395. There’s a brief video of the stove after the jump. If you’d like a simple, cheap, DIY rocket stove for camp cooking check out this previous post. According to their website, the Bobcat Rocket stove has gone out of production. Cool stove, but doesn’t it seem like it might gallop away with our food? It’s beginning to look a lot like, Christmas. Looks like you’re gearing up for a winter adventure. Canvas tent in your crosshairs, too? It might just be the purrfect enclosure to contain that hot Bobcat. Well, we’re not ready to pull the trigger on this just yet but, yeah, how nice would that be? A warm tent with its own woodstove… Awesome.